"Olé! What a great week and a great bunch of people. It was amazing to experience the racing at such close quarters, but it was also a lot of fun to enjoy our time together off the bike and on non-race days. The Spanish cities seemed so vibrant and welcoming. I will definitely visit the Vuelta again in future"
Often the most intimate and accessible of the Grand Tours, La Vuelta is earning itself a growing reputation as often the most exciting of the Grand Tours. Peppered with 'killer climbs' and benefiting from more 'open' racing than either the Tour or the Giro, the race is becoming a favourite with many fans. Whilst the finalé in Madrid or a wind-blown stage in the flatlands can each provide a worthwhile spectating experience, for us the best way to see the racing at its very best is to head to the mountains. Ride a key climb for yourself, choose a vantage point with an extended view of the road, set up camp and wait for the fireworks. You'll enjoy the fiesta atmosphere generated by thousands of other enthusiasts, then the growing sense of anticipation as the first TV helicopters come into view (often below you). Soon, there's your first glimpse (maybe 2-3km away) of the breakaway as they hove into view on a lower slope. How far adrift are the GC contenders and their super-domestiques? Is race radio reporting that any of the significant players have already been dropped? Then the lead police motorcycles and commissaire vehicles pass by and finally the race is right there in front of you - within touching distance. 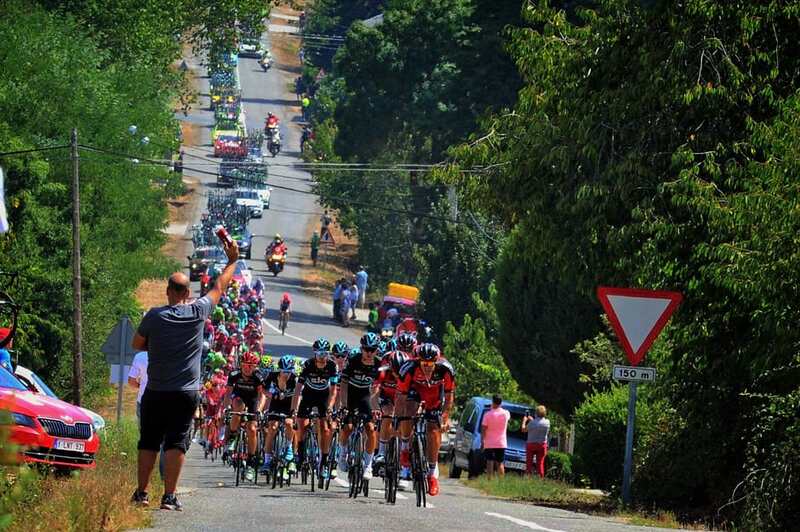 The crowds roar on the breakaways and their GC favourites, then turn their attention to a more 'consoling' level of support for the burnt-out domestiques sacrificed on the lower slopes and for the sprinters' 'gruppetto'. Perhaps 20-30 minutes after the first rider came into view the broom wagon rolls by and the crowds collectively exhale. Who grabbed the best photographs? Did you get to see the whites of Froome/Quintana/Nibali/Porte/Valverde's (delete as applicable) eyes? Who looked the strongest? We will be concentrating our 2019 Vuelta trip on the 'Grand Depart' (expected to be a team time trial around Torrevieja) and two subsequent 'lumpy' stages in the hills and mountains of the Costa Blanca. We will guide you to fantastic vantage points on each stage and then give you a further three days to ride the best of the region's climbs for yourself. Accommodation will be in cyclist-friendly 2/3-star hotels and authentic local 'casas rurales' (guest houses) selected for their accessibility to the racing/riding, comfort and quality of food.